Few things bring back memories that span across generations like neighborhood ice cream trucks and your first banana split. If you’re looking for a creative theme to celebrate a birthday or milestone with America’s second favorite pastime, consider upping the ante on your cool quotient with an ice cream social. 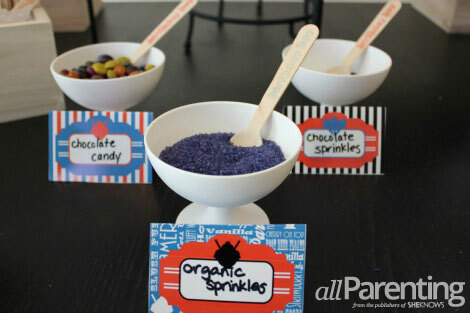 Just about everything for your party can be personalized to create your very own ice cream parlor -- from ice cream cone wrappers and cups to nostalgic little wooden spoons stamped with birthday messages or names. If you're the DIY type, you can buy white ice cream cups and label them yourself, then tie wooden spoons to each cup with matching string. Elements like these help tie in your theme, creating a cohesive look and add personal touches to your party. My Tip^As much as I love DIY, I had to be realistic about time. I found adorable printable cone wrappers and topping labels (Grace and Guy, $5-$6) on Etsy. I also found cups and wooden spoons (3 Sweet Memories, $22) that were made to match our theme and shipped in two days! From sprinkles to marshmallows and everything in between, create a toppings bar with bite-sized morsels that everyone will love. Consider a wide range of toppings to please even the pickiest little palate. Place the toppings in individual serving dishes and label them. My Tip^I'm obsessed with presentation. 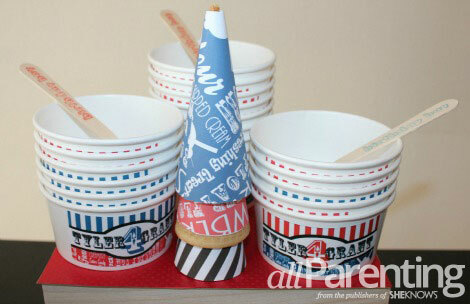 Since red, white and blue was the color scheme, I picked all-white serving dishes for the toppings and created DIY holders for our ice cream cone cupcakes with red and blue striped photo boxes. I tied in the tone of the wooden spoons with natural wood boxes that displayed the ice cream cups and gave visual height and depth to the spread. If your guests opt for organic, or if they've ditched food coloring or eat gluten-free, it's easier than you might think to accommodate everyone. When you're collecting RSVPs ask your guests if there are special dietary needs you should consider. My Tip^We skip artificial food coloring whenever we can and opt for organic when it comes to occasional sweets for the kids. Our toppings bar was stacked with organic and dye-free sprinkles ($2-$5) and assorted Unreal chocolate and candy (CVS, $5) toppings. We also had dairy- and gluten-free ice cream available. An ice cream social and a spread that gives guests options encourages everyone to be engaged in the action -- versus waiting around for cake to be served. 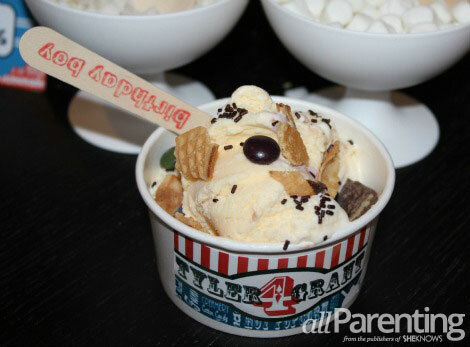 The toppings bar becomes a major conversation point, too, as guests try new flavors and compare their creations. My Tip^ Have an oversized galvanized tub full of ice and ready to go, then drop in pints or half gallons of several flavors of ice cream about 15 minutes before you're ready to serve. Set your ice cream bin in a spot where guests can scoop out whatever flavors they want before they hit the toppings bar.